Getting Live Cricket Scores on your mobile phone has become really simple and easy with the advent of Android and iOS phones like iPhone and iPad. In this article I will tell you about some ways to do so! And yes, as a bonus I will also tell you how to get live cricket scores for free via SMS or IFTTT. 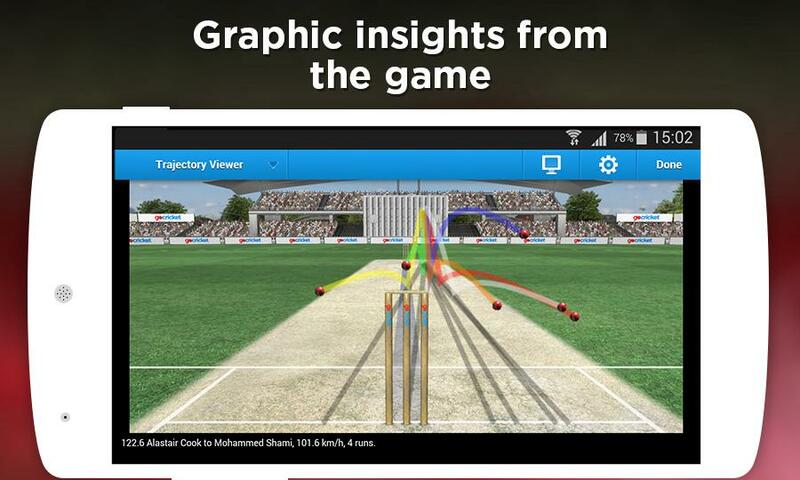 Cricbuzz App - With more than 50 lakh downloads this app is one of the best Cricket apps on the Android Play Store. It provides you with live cricket scores, ball-by-ball match progress commentary, total match coverage, cricket player details and news regarding all things under the sun related to cricket. This is the only mobile app that will soon have video highlights support which you can watch right inside the app. ESPN Cricinfo - There is no cricket fan in the world who is unaware of the Cricinfo website. It is one of the oldest cricket related portals out there with stellar content and the best user experience. We can get to see the same with their Android App which provides you with free cricket scores and notifications, live ball-by-ball commentary notes and other information such as player details and latest news. GoCricket - This is another great app for getting cricket scores on your Android mobile phones for free. Although it is not as popular as the other two apps what I shared above, but it has some great design and is very fast. As a cricket fan you should have multiple apps installed on your phone for getting scores, so when one app does not work properly, you will always have another one to fall back to! CricBuzz - As a cricket fan you might be unfamiliar with this portal. The CricBuzz app for iPhone and iPad is a really great way to get latest score updates and other match information. Its free to download and has a $1.99 in-app purchase that lets you listen to audio commentary of the matches. Yahoo! Cricket - This app provides a whole lot of innovative and informative graphical information in addition to the scores on your iPhone and iPad such as partnership graphs and match stats. Its totally free to download and does not offer any paid enhancement unlike the Cricbuzz app. ESPNCricinfo app - This app is the official companion app for the EspnCricinfo.com website and is totally free to use. It provides live scores, notifications and special player updates for you to follow. Send an SMS (text message) @cricbuzz score to 09243342000 (India only). For getting match schedules send @cricbuzz schedule to 09243342000. This is a paid service, in that you will be charged by your carrier for sending the SMS / texts. Another way is to use Zipdial for getting cricket scores live via SMS. Just call the number 080 300 500 55 from your phone and hangup when the call is received after which you will receive an SMS confirming the subscription to free cricket score updates. IFTTT is a web based service which provides recipes to do things online. You can visit the ESPN IFTTT page in order to subscribe to Live score alerts for Cricket free of any cost. Is there any other service that you might be aware of which I forgot to mention? Do let me know in the comments section. I updated the content of this post in order to reflect changes with the modern times. This post as originally written way back in February 2009 when Android and iOS apps were not used very much and users were much into getting scores using SMS (Text Messaging) but since then things have changed a lot and users have moved to using smartphones with mobile apps. Cricket is game which requires it`s fans and followers to stay up-to-date with scores in a match. These days cellular service providers are making a good business by sending Live Cricket Scores to their subscribers and charging them a good sum of money in return. Thanks to Google SMS Channels. Getting Live Cricket scores is now very simple and the important thing is they are FREE. You just need to Sign-Up for Google SMS Channels (discontinued by Google India), which is again FREE of any charge, as usual with all Google Products for public use. After which you need to specify your phone number on which you are willing to receive the Updates – Live Cricket Scores. Then you need to subscribe to Cricket Channels in Google SMS Channel Listing. We have hand-picked four such channels for you. You can subscribe to any one of them for getting Live cricket scores Regular Cricket related Updates right on your mobile phone via SMS, again all for Free. Cricket Live Scoreboard – Fast Score Updates with over 35K subscribers already and counting. Cricket Center – Very Fast and Up-to-date cricket scores. For getting Free Scores on your Android Phone, see this.